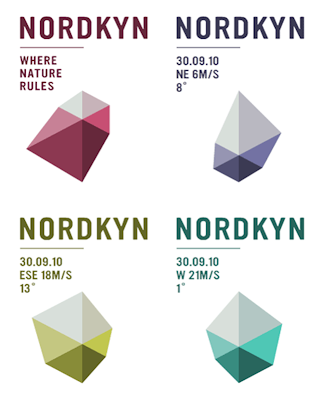 Remarkable destination branding for Nordkyn in the very northernmost tip of Europe, in Finnmark, Norway. The beauty of the brand is communicated in its cool animated version which displays the changing colours and facets of this beautiful, rugged, Arctic place. The logotype morphs continually subject to weather change, wind direction and temperature! See the animation here. Design by Neue Design Studio, Oslo. The brand is so powerful that it makes you want to get on a plane right now to discover a place you have never even heard of before. Now that's successful.